Oh hai fellow humans, super-intelligent animals and unidentified life forms. As you may know, I'm currently on another year out from uni due to my health but I'm planning on resuming my studies come September. I swear I'll graduate at some stage of my life...As a student of Creative Writing, I have to submit a creative dissertation at the end of my third year which is super exciting but also quite the creative burden. I thought I'd start a diary, of sorts, to document my progress, my aims and the many hurdles that I stumble over along the way. 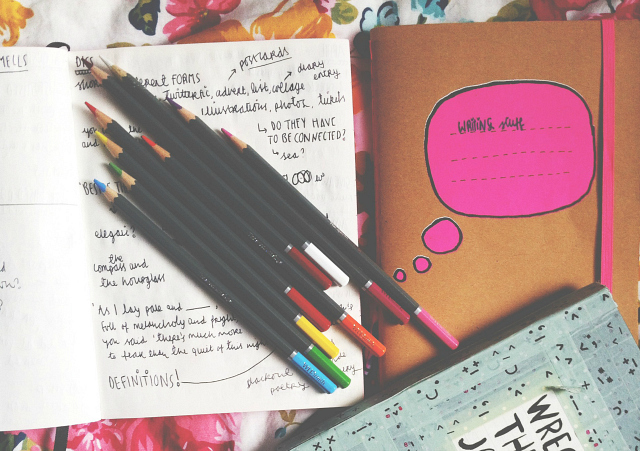 These posts will be the hub of my creative anxiety, basically! However, I'm hoping it'll also prove to be useful to those of you who want to work on your own creative projects but don't know where to start. You can even work alongside me! I'm definitely not an expert but I am vaguely enthusiastic...What more could you ask of me?! If you've got your own hints and tips for fellow creatives, please leave them in the comments section below. From this tiny piece of fiction, I came up with the idea to write a piece of surrealist bizzaro fiction loosely based on a very post-apocalyptic world where anything and everything is possible. It's a little difficult to put my vision into words, especially as I'm not sure what it is yet, so bear with me. Whilst it's going to be a little out of the ordinary and full of adventure, I want it to still feel inherently human. I'm going to be playing around with form throughout to create something pretty fun and a little different, hopefully. I also have a name...drum roll please...And So, We All Float On. What do you think? It's subject to change, of course, but for now I'm going with it. And So, We All Float On is actually taken from a line by the leader of a brigade that navigates the skies in hot air balloons, circus tents, wendy houses and the like. That sort of gives you a taster of the project, I'm sure! There's still a lot of shaping to do before I really know what I'm going for and that's something that I really want to work on before our next update which will probably be next month. I think one of the biggest things that I need to devote time to is deciphering the tone. I'm not entirely sure what I'm going for yet and it's stunting the whole process. I also need to work out what my aims are with this collection. What do I want people to go away and think about? What do I want them to feel? By shaping my ideas, I'll hopefully be able to move forward with them and imagine characters that will be able to facilitate them in the way I'm hoping for. I've got quite a lot to think about but hopefully I'll get there. Work out where you work best. A lot of people say to avoid spaces where you do other things but I don't think that's always correct. I always seem to work from my bed, whether I'm hidden away underneath a billion blankets or sprawled on top of it, it's the space that is most available to me and the one that works best for me. I'm typing this from my bed and it's not going too badly, right?! 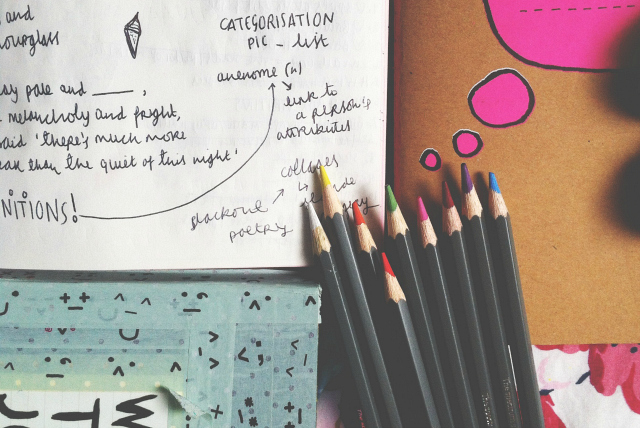 You're going to want to assign yourself a notebook, pen and a backpack of some kind to collect all of your creative goodness in. A creative sheath, if you will. Oh God, that was horrible. I'm sorry I ever typed that. If you're like me, you know all of the things that limit your creativity and yet you always always always fall for them. Whilst I don't police myself as such, I like to acknowledge my creative vices and work out how to manage them in a way that doesn't thwart my productivity too much. For instance, I find that silence really jars my writing so, more often than not, I work to music. Loud music. I know, I'm a strange one. If social media is your downfall, set yourself hours outside of work dedicated to mindlessly scrolling. However, if I'm being honest, I think a lot of the time social media timelines induce the death of all creative thought so I'd give them a wide berth whilst you're in the early stages of writing. 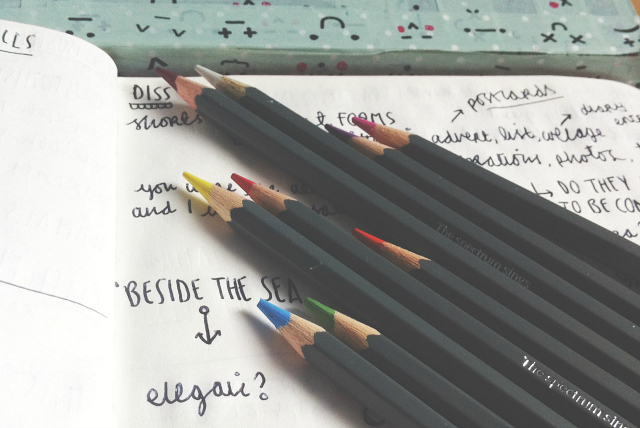 Immerse yourself in creative fuel and I'm sure you'll reap the rewards! I like to immerse myself in art, film, music, photography and adventures before undergoing the first steps of the writing process. Lately, I've been watching things that encompass, and essentially inspire, the vibe of my current project such as Adventure Time and The Mighty Boosh. I also like to read poetry and listen to songs with lyrics that I greatly admire. I created a Pinterest board a while back to store inspiration and it has proved to be a helpful little mood board to look over when I'm searching for ideas. It's a private board but here's a few stills to give you some idea of the things I like to store. You could even create real life boards around your room to inspire you further. I've also got a Tumblr full of goodies that I refer back to when writing. Have a bit of fun with it. Sometimes, your creativity is there but you need to exercise it a little to get it into shape. 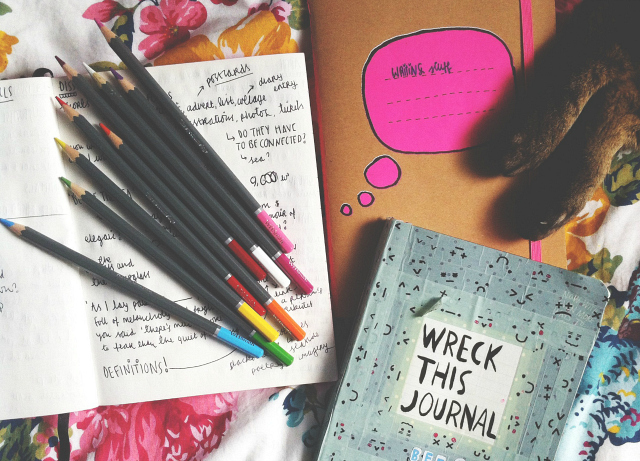 I found my Wreck This Journal a great resource when beginning this project because it allowed me to be creative in a completely critic-free way. I also find music to be a really great resource. Whether it's by penning a blog post, singing out loud, watching your favourite film or penning a 140 character story, once you've inspired your creativity you'll find your project a lot easier to handle and envision. What a great project, I love it! I also really like doing things like this myself! Oh my your cat's paws are adorable! Ooh good luck! I did creative writing as well but chose to do two dissertation modules because the other modules we had to choose from were a bit rubbish! Wish I'd been as organised as you though... I still hadn't decided what to do for one in the December of my third year! All worked out in the end though. Although I haven't done any creative writing since uni (4 years ago!). Need to get back into it! This is one reason I like your blog because whenever I read a post I always then feel motivated and inspired to write again! Which is good, so thank you! Best of luck with the dissertation! I studied Creative Writing as well and love your tips. I think the biggest challenge I had was letting go of my first sentence: the whole story idea grew out of this one sentence that popped into my head, but as I wrote it I realised the sentence didn't work any more. I tried to keep hold of it and work it in, but eventually had to give it up. So I guess my advice would be to let the story grow and let go of the parts that don't work any more. Good luck! Your pinterest board looks amazing and I'm looking forward to the progression of your creative writing, it seems surreal and all things beautiful!